Licking the inside of an empty bowl in public would be gauche. But I considered throwing any and all social graces aside in order to lap up every last bit of my Pernod-spiked lobster chowder. Maybe if I just surreptitiously scrape the bowl with my pinky and quickly slide it in the corner of my mouth ever-so coyly?, I found myself contemplating. No, that wouldn’t do. Instead, I asked for the recipe so that I could make Duke’s Chowder House’s stunningly delicious lobster Pernod chowder at home. Yes, this recipe makes one gallon, and that may seem like a lot, but I promise you this, you’ll thank me when you remember the extra you have in your freezer. There's also a gluten free version for this recipe too, so read on for instructions. 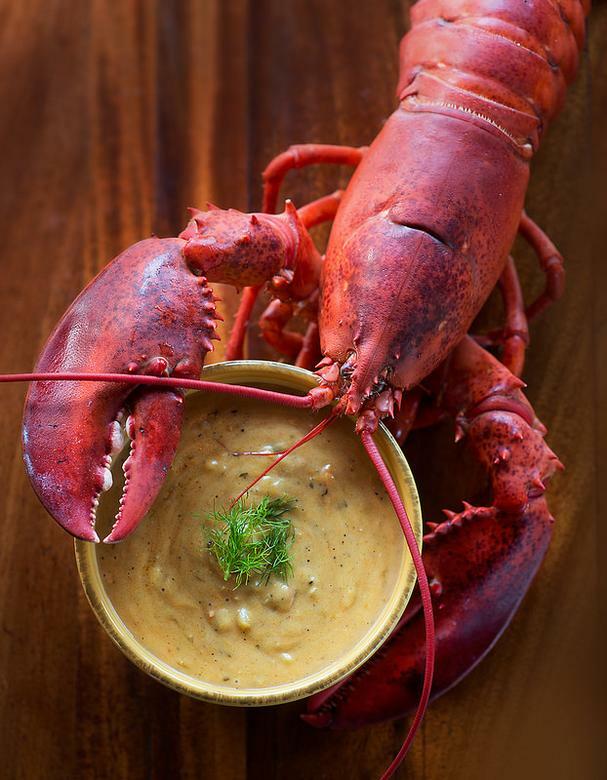 The combination of the licorice-tasting Pernod, Langostinos (not really lobster but known as such because of their taste and shape) and lobster base is truly a unique flavor and only available at Duke’s. ~ Excerpt from Duke’s soon-to-be-published cookbook. In a heavy-gauge soup pot, melt butter. Add fennel, onion, celery and shallots and sauté over medium heat until veggies are soft. Make roux by adding flour. Stir well to incorporate. Continue to cook, stirring continuously, for 7 minutes at 165 degrees. Do not brown roux. In a separate pot, boil sweet potatoes in lightly salted water until el dente. Remove potatoes from water and set aside. Mix hot water and Lobster base and stir until base is completely dissolved. Slowly add Lobster stock (base and water) to roux mixture while stirring. This will keep the roux from getting lumpy. Bring mixture to 180 degrees. Add cream and spices and bring back up to 180 degrees. Add langostinos and liquor and bring up to 190 degrees for 5 minutes. Chowder tastes best at 165/175 degrees. If not serving immediately, cool rapidly in shallow pans in the refrigerator. If re-heating, do so medium heat (too hot will cause scorching).